A team of scientists at the National Chemical Laboratory, Pune, and the Institute of Chemical Technology, Mumbai, has developed a non-toxic technique to recycle plaster of Paris (PoP) waste from hospitals and convert it into useful materials such as ammonium sulphate and calcium bicarbonate. In hospitals and other medical centers PoP is mainly used for setting broken or fractured bones or for making casts in dentistry. It is a hazardous waste, loaded with bacteria, and affects not only the environment, but also people who collect, segregate, and dispose it. The new technique treats PoP waste with ammonium bicarbonate solution with a concentration of 20 percent. The solution disintegrates the waste into high value and non-toxic chemicals, ammonium sulphate and calcium bicarbonate in the form of sludge in 24-36 hours at room temperature. The resultant material ammonium sulphate can be utilized as nitrogen fertilizer, fire-extinguishing powder, and in pharmaceutical, textile, and wood pulp industries, while calcium carbonate can be easily used in steel manufacturing. The new technique can also be used to disintegrate PoP waste from idols immersed in water bodies. The study results have been published in the International Journal of Environmental Science and Technology. Read the full report by Vaishali Lavekar. A spoonful of yogurt could soon offer a cheap and simple way to screen for colorectal cancer. MIT Professor Sangeeta Bhatia is working to replace costly and uncomfortable colonoscopies and MRIs with a helping of yogurt followed by a urine test—a cheap method that could improve the early diagnosis of colorectal cancer. Bhatia is developing synthetic molecules that can be introduced into the body via yogurt, and will interact with cancer in a way that produces telltale biomarkers. These molecules can then be detected easily when passed in urine. Scientists at the Indian Institute of Science, Bangalore, have developed a handheld device that can diagnose malaria within 30 minutes, from just a little drop of blood. The team has developed a lab prototype of the low-cost diagnostic instrument that takes a small sample of blood, analyzes individual cells, and detects cells that are infected by malaria. A team of researchers led by Dr Sai Siva Gorthi, assistant professor at the Department of Instrumentation and Applied Physics, IISc, developed and incubated the device at the Robert Bosch Centre for Cyber Physical Systems (RBCCPS) at IISc. The device, which is small enough to fit into a hand, has a common optical reader into which the user slides the blood sample in a replaceable microfluidic cartridge, each time a new test is to be performed. Cartridges are preloaded for automated processing of the blood samples. The affected blood cells display morphological features that are different from normal cells; just by looking at the cell images on the LCD display, it’s clear if the cell is infected or not. The device uses algorithms that run on a smartphone-like platform for automatic evaluation and therefore does not require a skilled technician for handling the instrument. Qualitative test results can be known instantaneously while quantitative parasitemia levels are assessed and displayed in about 30 minutes. Malaria, a mosquito-borne disease, is rampant in developing countries. In India, over 13 lakh malaria cases were reported in 2011 of which 754 people died. In rural India, due to lack of primary healthcare, villagers have to travel to the nearest town or city for diagnosis. The diagnostic process — from taking blood samples, to manually analyzing them under a microscope, to preparing a report — usually takes more than a day and makes it challenging for healthcare workers to get back with recommendations for treatment. The new approach, however, combines technologies like image processing, microfluidics and microscopy. A team of scientists and engineers at the Indian Institute of Science (IISc. ), Bangalore, have created a ‘microneedle’ that take the sting off injections. The new microneedle is one-third of the thickness of conventionally used needles. With a diameter of just 130 microns, these injections can deliver drugs almost painlessly. The innovation can definitely prove to be good for diabetics who need frequent insulin injections. Unlike the conventional stainless steel needles, these microneedles are made of silicon and are arranged in a set of several needles to deliver drugs of a required quantity. Initially the team had a challenge to resolve as silicon is not always “biocompatible”. It reacts with blood plasma and can corrode with time. Therefore, the researchers decided to coat the needle with fine layers of titanium and gold through electroplating. The coated microneedle are currently at the animal-testing stage and it could be a while before they are tested clinically on humans. Read more in a report by Divya Gandhi. 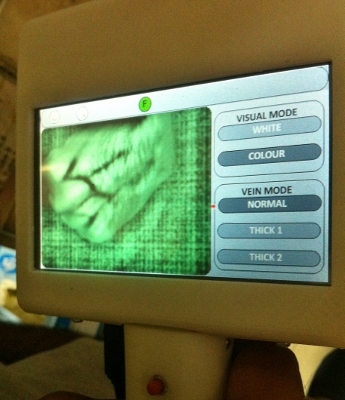 The Veinus displays vein map of a man’s hand during the pilot at St. John’s Hospital, Bangalore. 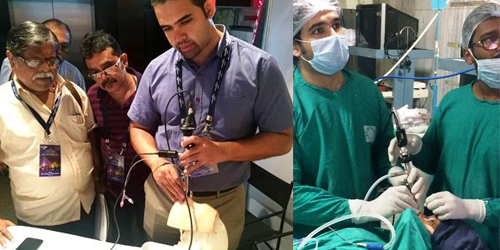 A Bangalore-based startup has developed India’s first vein detector, ‘Veinus’, a non-invasive device that could help doctors locate good veins for inserting venous cannula. Veinus is likely to cost about 80% less than the imported vein detectors. Better cannulation with the help of Veinus may mean less number of needle pricks for millions of patients worldwide. According to a report, even though venous cannulas are often needed for a week or more, they frequently fail before the end of treatment because of irritation of the vein and therefore necessitate cannula removal and replacement. 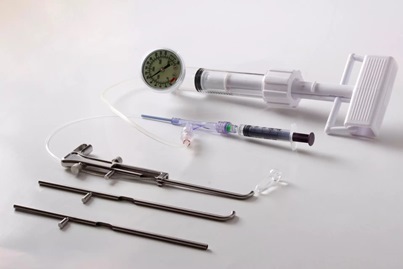 Replacement requires additional needle pricks for patients, increases work for clinical staff, and contributes to insertion of cannulas being the most common invasive medical procedure and therefore a substantial contributor to healthcare costs. In a step to aid this medical procedure, Bangalore-based Infraeyes Private Limited developed Veinus, a vein detecting device that uses infrared light to display map of good, thick, as well as thrombosed veins under the skin.